We’re amazed we didn’t stumble across this ill advised burnination sooner. 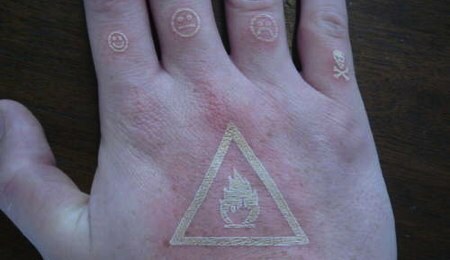 Earlier in the week [tetranitrate], of LED chess set fame, posted his experiences using a laser cutter to scarify his own skin. It’s very painful, not to mention the discomfort of smelling your own burning flesh. He’s using an Epilog with a magnet over the safety switch. To get the positioning right, a layer of painters tape was put down and then etched. For a less painful version, you could try Bre’s fingernail calendar from last Fall. Video of multiple tattoos embedded after the break.